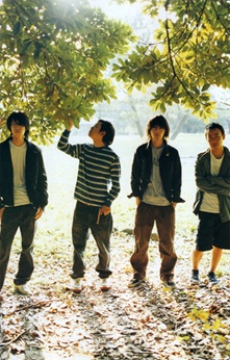 Bump of Chicken consists of four members: Motoo Fujiwara （藤原基央） Motoo Fujiwara "FujiKun" is the composer, lyricist, guitar, and main vocalist of the group. He has written most of the music, and has also drawn the artwork for their albums 'The Living Dead' and 'Yggdrasil'. Hiroaki Masukawa （増川弘明） Hiroaki Masukawa "Hiro" is the guitarist of the group, and also writes most of the hidden joke tracks for albums. He is referred to as the shy member of the group, and calls himself pessimistic. Yoshifumi Naoi （直井由文） Yoshifumi Naoi is the bassist of the group, and is referred to as the "crowd pleaser". Also known as Chama. He jokes that he "falls ill exactly four times a year." He also calls himself an anime and game otaku, and a "rare genius". Hideo Masu （升秀夫） Hideo Masu is the drummer for the band. He describes himself as an introvert. He also mentions that he has good eyesight, cannot write kanji well, likes to go outdoors, and often gets headaches.